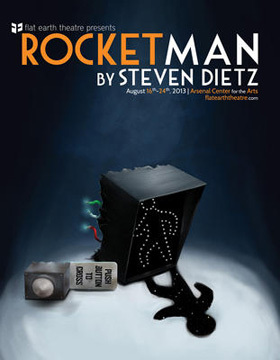 Flat Earth Theatre Blasts Off With Steven Dietz's "Rocket Man"
With Steven Dietz's "Rocket Man"
Flat Earth Theatre ventures into the final frontier August 16 - 24 with "Rocket Man," Steven Dietz’s creative and probing account of self discovery. To be presented in the Black Box Theater of the Arsenal Center for the Arts, 321 Arsenal Street in Watertown, the production will be directed by Lindsay Eagle, past Artistic Director of the critically acclaimed Independent Drama Society. Tracking the lives of its characters across parallel universes, "Rocket Man" addresses themes of fate, family, and the ability to communicate with the ones we love. As Donny Rowan waits patiently for the traffic lights to change, the rest of the world has passed him by, his ex-wife has moved on, his teenage daughter is slipping away, and even his closest friends can't seem to connect with him. Fed up with the seeming futility of life in this universe, Donny sets his sights on another: a parallel dimension where the standard laws of time and space no longer apply. So he puts his life up for sale on the front lawn and scans the heavens from an E-Z Boy recliner in the attic, preparing for a journey that will take him beyond the limits of this mundane reality. However, all may not be what it’s cracked up to be. For tickets and information, stop by the box office, call 1-800-838-3006 or visit PushToCross.com. Students with valid ID can purchase $10 student rush tickets in person at the theater beginning one hour before the show There will be a Pay-What-You-Can performance on Thursday, August 22 at 8 p.m.